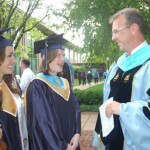 On June 5, 2012, 453 Penn Manor graduates received their diplomas. Valedictorian, Mikayla Herbert, and Salutatorian and Class President, Ellen Blazer, led the graduates into the Franklin & Marshall Alumni Sports & Fitness Center. 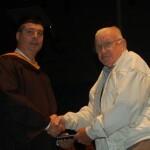 High School principal, Mr. Philip Gale, welcomed the students and their families and as well as special graduate, Mr. Philip Fisher, a Korean War veteran who received his diploma. Congratulations and good luck to the Class of 2012.